Excellent vacation or primary home. This beautiful second floor end unit condo overlooks the sparkling heated swimming pool and lush green space. Upon entering this bright and open condo you'll notice the two windows allowing for lots of natural light in the living and dining room areas. Walk out of the sliding glass doors to the first of two screened lanais. Have morning coffee, happy hour with friends or all of your meals on the screened lanais. The kitchen is well equipped and has a laundry closet for ultimate convenience. The guest bedroom boasts a wall of built-ins with a murphy bed and a desk, making this a perfect bedroom/office space. Walk out to the lanai from this multipurpose room. 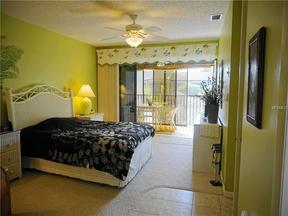 The spacious master bedroom has a private lanai and great master bathroom with a shower and bathtub. Condo is in the rear of the complex making it peaceful and quiet. Seller is very motivated.